Mrs BotF was keen to inject some funds into the Daylesford economy, just not into the parts in which I’m interested. A quick look at the map indicates that Daylesford is close enough to Woodend which is the home of the Holgate Brewery. 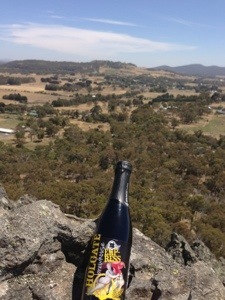 In turn the Holgate Brewery is close to Hanging Rock, a real place that has been made famous by a fictional Australian novel. 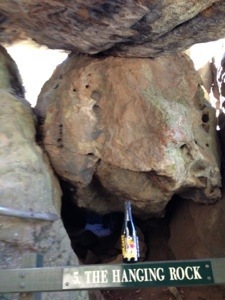 To earn a drink at the brewery, an ascent of Hanging Rock is required. Hanging Rock is about 7kms from Woodend. It is 6 million years old and is a remarkable geological formation. It is an untaxing climb, but the views once at the top are as good as gets. The rock formations are quite wonderful and you get some amazing photos looking out over the plains around the Rock. The eponymous Hanging Rock is actually pretty modest. The real highlights in my opinion are on the summit. There are many spikes and turrets that provide great places to stand upon and absorb the wonderful vistas below. 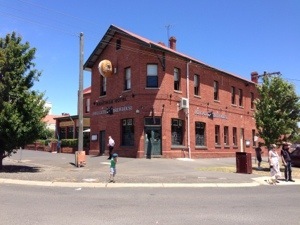 The Holgate Brewery is one of the greats of the Australian craft brewing scene. It started last century(!) and powers on to this day, continually expanding in size and range. It resides in Keatings Hotel, which was built in the 19th century. 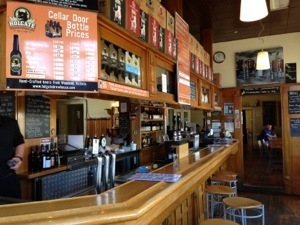 The front bar is where the beer action happens, and all of their greats are available. I was driving so wasn’t able to enjoy too much “Straight from the Gate”, but I had a special to try later. Empress is very big beer. The bottle describes it as an “Imperial Mocha Porter” and it really is imperious. A massive 10%, it is a real sipper and 500ml is plenty big enough. The long, long rich taste, the big nose and the aftertaste are all stupendous. A $20 buck beer has to be good and this is worth every cent.